With wellness gurus and bloggers focussing on green juices, avocados and teas, coffee isn’t often written about and I thought I would correct that with a post about a fairly new brand on the market, started by two guys and a girl, called Cru Kafe. Cru Kafe was created by three creative professionals: Colin Pyle, an entrepreneur and travel presenter, who is also responsible for brand’s podcasts and interviews, Bodil Blain, a Norwegian former model, who studied at London Business School, focussing on NGOs and corporate responsibility and chef John Quilter, who makes great videos on the best way to make and drink our coffees. Jointly the trio works on PR and product development, doing the tasting together – from the sideline it feels like a type of team where things are done jointly and with immense passion for life, customers and coffee. The brand was born out of a simple desire to deliver delicious organic coffee, sourced ethically, from around the world, in the convenience of Nespresso friendly, recyclable capsule – the brand now also makes coffee for cafetière, if that’s how you prefer to make your coffee. So what you get, it not just Soil Association certified coffee, you also have delicious and unusual beans ( Fair-trade certified ) sourced from around the world and charming customer service, which includes a free taster box, if you fancy trying the coffee before committing to a bigger order. Bodil, Colin & John met through friends and somehow Bodil’s inner desire for her own brand found its creative outlet. As a mum, Bodil didn’t want aluminium anywhere near her own children and for the business to have a healthy, as well as ethical, aspect was import to the trio. The idea took about two and a half-year to nurture and complete and then the business was launched. With an article about the brand in The Sunday Times and support from friends ( PR guy Mark Whelan was the one who ‘gifted’ the idea of the brand’s name and female entrepreneur extraordinaire Carmen Busquets is a very enthusiastic & vocal supporter ), the business continues to grow and expand organically, slowly challenging position of Nespresso at the top. I, for one, never took to Nespresso capsules because I got annoyed that I can’t recycle them. Another point of interest, is brand’s innate tuning in into customer’s needs. Unknown to him, John actually came to my rescue. Since my husband received a Nespresso machine as a gift a while back, every time I made myself a cup, I got frustrated that unless I gulped my coffee, it became too cold too quickly, taking the actual pleasure of my morning coffee savouring away. The video below actually taught me a trick that ended my frustration and helps me now thoroughly enjoy my morning Cru Kafe. 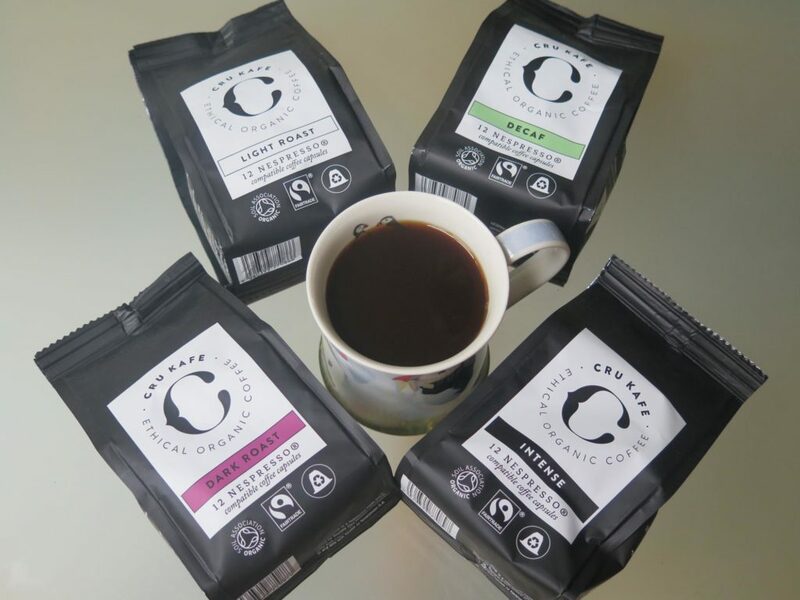 Cru Kafe also continues to expand online and has such stockists as Ocado and Soho House. They also had a beautiful pop-up in the spring in Notting Hill. Located on a quite, leafy street, you could wander into their peaceful store, order a cup or two of Cru, browse magazines at a cosy, wild-wood table and luxuriate in the peacefulness of your morning. They also hosted evening events, with the likes of nutritionist Amelia Freer, proving that coffee gets an approving nod from those professionals that work in the food & wellness industry ( Eve Kalinik is also a fan of Cru ). Modern consumers are becoming savvier and more interested in provenance of their food and drinks, so Cru Kafe always provides information on where their coffee comes from ( for example their 100% organic arabica beans are grown 2,000ft above sea level, which positively impacts the way coffee tastes ), stories behind the growers & insightful and fun videos. Cru team not only believes, but practises, speciality approach to roasting and doesn’t use chemicals or unethical practises when sourcing their beans for their roasts. When you have time to linger and fancy expanding your coffee knowledge, browse Cru’s online journal or YouTube videos – a useful way to slot some ‘me-time’ into your day! A while back I was re-reading ‘The Feelgood Plan’, written by trainer Dalton Wong and journalist Kate Faithful-Williams, where they actually talked about organic coffee and here is what you might find useful: ‘organic coffee doesn’t contain any traces of pesticides or fungicides. It is literally ground coffee beans and hot water. Make your coffee count by drinking a cup when cortisol naturally dips in the day, so you feel more alert in an energy slump. Caffeine increases production of cortisol, the stress hormone. so try waiting until after breakfast to have your first cup, around 10am’. While yours truly starts her day with coffee at times preceding breakfast, it is the advice that I put into practise more and more, at least trying to ‘cushion’ my stomach with breakfast, before enjoying my morning coffee, without doing disservice to my body ( it helps to remember that too much coffee can tense muscles, increase heart rate, interfere with digestion ). As far as I am concerned and like with many things, caffeine is good in moderation – a single cup of coffee can create a state of relaxed alertness, making it a helpful sidekick to your workout routine, especially when you need to push yourself a bit – but two to three in one go (and I have friends who easily pop them, like smarties and one particular friend, who works in finance, who until recently downed 20 (!) cups of Starbucks espresso a day) can make you a little edgy and interfere with your adrenals work. The secret is to find good quality coffee that you enjoy drinking and take time to savour it, like you would good wine.